Welcome to Top Product Comparisons! 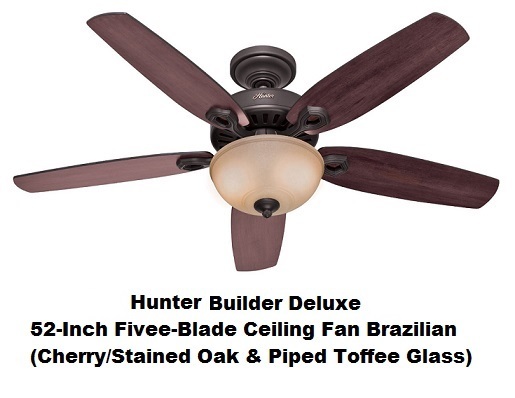 Compare 5-Blade Ceiling Fans: Westinghouse Comet or Hunter Builder Deluxe? Did you know a ceiling fan can help lower your electric bill by up to 30 percent and maybe even more both during the summer and winter? While a ceiling fan doesn’t actually decrease the temperature of a room, during the hot summer days, the draft that is generated makes the room feel cooler, allowing you to raise your air conditioner’s thermostat and be just as comfortable. This saves you energy and money. Many people are unaware that ceiling fans can also be used to circulate warm air during cooler months of the year. During the winter, if your run your fan in reverse and at a lower speed, it will draw the room air upwards towards the ceiling and force the warm air down and out towards the walls, causing you to feel warmer without having to raise your heater's thermostat any more than is required. This again saves you energy and money. To get the benefits of a ceiling fan all year-round, it is therefore important to get one that is reversible. Note that if you’re replacing a light fixture with a ceiling fan or installing the fan in a room without perfect lighting, you might want to consider a ceiling fan with a built-in light fixture which can also contribute to the layered lighting design of your room. 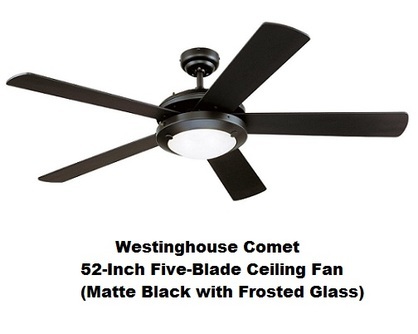 This article will compare Westinghouse Comet and Hunter Builder Deluxe 5-blade ceiling fans. These were not just the most popular in their category among Amazon customers at the time this article was written, but they had also received excellent reviews from most Amazon buyers (an average of at least 4 stars each out of 5 stars!). Selected Hunter and Westinghouse Ceiling Fans on Amazon. "cu-ft/min" stands for cubic feet per minute. Blade pitch is the angle of the fan blades as they move through the air. Fan blades with a relatively flat pitch, around 10 to 15 degrees, do not require considerable motor effort to reach a high speed, which is good for energy savings. For both fans, various colors, blade materials and finishes are offered. For exact colors and finish descriptions see the Amazon products section below. When you click the Amazon product link images, you will be offered a choice of colors and finishes. Neither of these two ceiling fans come with a remote control device. They are equipped with 2 pull cords/chains; one to turn on and off the light and a second for adjusting the speed of the fan (off/slow/medium/high). There is also a manual reverse switch on motor. Note that these fans are adaptable to be used with a remote control unit that can be bought separately (see the Amazon products section below). During the summer, your fan should run counter-clockwise (i.e. in the forward direction). This will force the cool air down, giving you the wind chill effect that will also make you feel cooler. During the winter, your fan should run clockwise (i.e. in reverse) at a lower speed. This will draw the room air up towards the ceiling and force the warm air down and out towards the walls, avoiding giving you the wind chill effect. "cfm/w" stands for cubic feet per minute per Watt. Westingouse provides a lifetime motor warranty and a 2-year warranty for all other parts. Hunter provides a lifetime motor warranty. So which ceiling fan should you buy? Hunter or Westinghouse? Both ceiling fans considered here are excellent products as shown by the average rating each had received from Amazon customers at the time this article was written. Indeed, Hunter Builder Deluxe had received 4.5 stars (out of 5 stars) and Westinghouse Comet had received 4 stars. There is a good chance that you would be quite happy with either of these two products. If desired, Hunter Builder Deluxe can be installed without the light fixture. Westinghouse Comet must be installed with the light fixture. 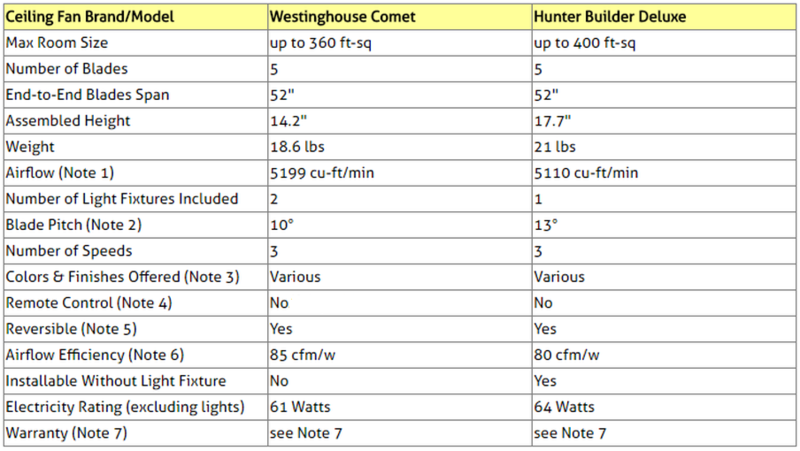 Westinghouse Comet comes with 2 light fixtures while Hunter Builder Deluxe comes with only one. Please click the ceiling fan of your choice below for price information or to purchase. ​Controls fan speed and light level without leaving your seat. Can be used with most ceiling fan brands. Included receiver must be wired to the fan at the ceiling. 40-foot operating range and three fan speeds for maximum convenience. Includes wall bracket and 9-volt battery. Full-range light dimming and manual light operation with wall switch access plate. Includes separate buttons for 3 fan speeds plus "instant off" for quick fan control. Auto-detection feature automatically switches between incandescent and CFL bulbs to prohibit light dimming if non-dimming CFL bulbs are used. Includes wall cradle for handheld remote control. ​Have you not found yet what you were looking for?